I served this recipe when a friend came to have lunch. So I decided to make it special and to prepare fish. It’s supposed to be cooked on the barbecue, but I used my plancha. 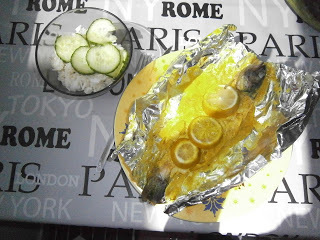 It was really delicious, and I served it with lemon rice. Yummy! Remove the skin of the fish and cut 3 gashes in the fish. Chop the onion and the garlic, add the curry and the coconut milk. Add salt and pepper, stir well. Pour half this preparation on the fishes, especially on the gashes. Cut the lemon and the cucumber in thin slices. Cut some aluminium foils, put some of the preparation in the middle, place the fish, put some more of the preparation and put 3 slices of lemon. Cook on the plancha (or the barbecue) for 20 min.